For some time there had always been a question in peoples' minds as to why the government had allowed the Congress of the People in 1955, to take place. In 1956, their question was answered when 156 Congress leaders were arrested and put on trial for high treason. The swoop came in the early hours of the morning of 5 December and was executed with military precision. Surrounded by elaborate security precautions, those arrested were driven or flown in a military aircraft to Johannesburg, where they were imprisoned in the Fort Prison. One unplanned consequence of the mass arrests was the opportunity they gave to the resistance leaders (who had been confined in two large adjoining cells) to meet openly and uninhibited, a situation which the government had been at pains to prohibit for several years. As Chief Luthuli recalled, "What distance other occupations, lack of funds, and police interference had made difficult - frequent meetings - the government had now insisted on." The government's aim was to break the power of the Congress Alliance once and for all, since the previous bannings and banishments had not worked. A trial was set up and unusual measures were taken to make sure of the verdict, including special legislation being passed by parliament for the trial. The legislation allowed for a Special Court to be created, with three judges rather than the usual one. Furthermore, the courts allowed the Minister of Justice to handpick the judges. The accused faced charges which claimed that they had participated actively in the campaign to draw up the Freedom Charter. According to the prosecution, the Charter visualised the abolition of all racial discrimination and the granting of equal rights to all. Combined with the slogan 'Freedom in Our Lifetime', the Charter was considered revolutionary, as it would involve the overthrow and destruction of the existing state. In addition, the prosecution claimed that this campaign implied violence, as only violence could reasonably be expected to achieve these ends. The prosecution also accused the trialists of planning to establish alternative appendages of government, and of trying to establish a communist state. This claim was founded on a memorandum proposing that the sponsoring organisations prepare a common voters' roll of everyone over the age of twenty-one, that the country be divided into electoral districts, and that a general election for representatives to the Congress of the People be held on a certain date. Before the prosecution case was even completed, charges were withdrawn against 73 of the 156 accused, however those 73 were still quoted in the indictment as 'co-conspirators'. Amongst those released were African National Congress (ANC) President Chief Albert Luthuli; African National Congress Secretary General Oliver Tambo; Yetta Barrentbatt, general secretary of the South African Congress of Democrats and I C Meer and Debi Singh, prominent officials of the South African Indian Congress. Of the ninety-one accused, fifteen had been members of the Communist Party and thirty were Whites or Indians, but only two of the Communists and five of the Whites and Indians were included among the final thirty accused. Only a few of the African accused were ANC leaders of importance. The alleged adherence of the thirty to the conspiracy covered a shorter period of time than that covered by the original indictment (instead of October 1, 1952, the period began on February 1, 1954, running until December 13, 1956), but the Prosecution's evidence against the thirty covered the longer period and included speeches and documents of the persons originally accused and the co-conspirators. No particular conspiracy by the thirty was alleged. The official announcement in November 1958 that the trial would proceed against only thirty of the accused had stated that the remaining sixty-one would also be re-indicted on a charge of treason and that their trial would begin on April 20, 1959, or afterwards. Presumably they were to be tried after the conclusion of the trial of the thirty. However, on April 20, no later date having been set, the sixty-one appeared in court. They had been divided into two groups, each facing an indictment (covering different periods of time) that was essentially the same as that faced by the thirty in January, but totally lacking in particularity. Because of this failure, the Court quickly and surprisingly granted the Defence motion to dismiss the indictment. The sixty-one still faced re-indictment. Speaking later, on May 12, 1959, about "the ordinary course of justice", the Minister of Justice said, "This trial will be proceeded with, no matter how many millions of pounds it costs - what does it matter how long it takes?" "On all the evidence presented to this court and on our findings of fact, it is impossible for this court to come to the conclusion that the African National Congress has acquired or adopted a policy to overthrow the state by violence, that is, in the sense that the masses had to be prepared or conditioned to commit direct acts of violence against the state." All the judges agreed that the state had failed to prove the ANC or the Freedom Charter as communist. 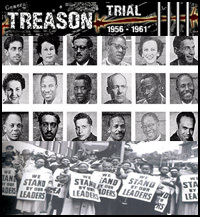 Therefore, after the longest Treason Trial in South African history, the remaining accused were all acquitted of treason. The government's strategy to eradicate the Freedom Charter at birth had failed.